Route 30 in Ohio is mostly a dual carriageway but there are segments of the old road through various communities and at times, alongside the big road. 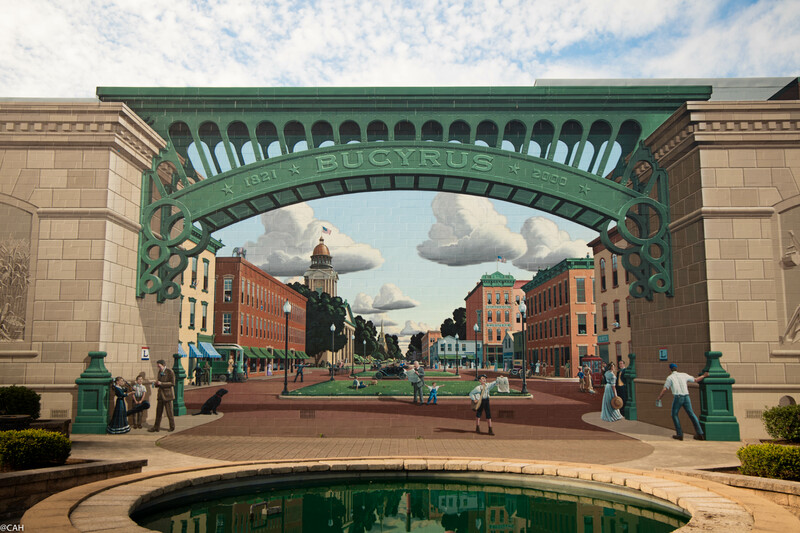 Our first stop this morning was Bucyrus which has a large mural entitled ‘America at the Crossroads’. The garden in front is looked after by the local Rotary Club and two people were tidying it up and we got chatting. The woman told me that local people had been used as models for the people in the mural. We got into politics on both sides of the pond and the local economy. The man said that his son farmed 12,000 acres ‘..that’s not a farm, that’s a corporation’. In a nearby café, another local was at pains to tell us how much the town was spending renovating the 19th century town hall. Afterwards, we looked at another mural and then had to head back to the road. Before leaving I had compiled an extensive playlist for the trip and on day one, hooked up my iPod to the car audio system. It recognised the iPod and then stuck at ‘indexing’. This has never happened before but after a quick internet search it seems I am not alone. Many people have had problems with Ford’s system and their iPhone or mp3 player. The suggested solution was either to reset the system or remove the fuse: I would do this in my car but not in a rental car. So we are stuck with the radio – with the inevitable adverts and having to find yet another station as we move away from their signals. It reminds me of a trip to New England about 16 years ago when our son had acquired a Simpsons CD and we were stuck with that for 2,500 miles. Back on R30 there are plenty of shredded tyres by the road and the occasional roadkill corpse, mostly raccoons. We are still not far from the railway, mostly used by freight trains and tracks often running through the middle of town. 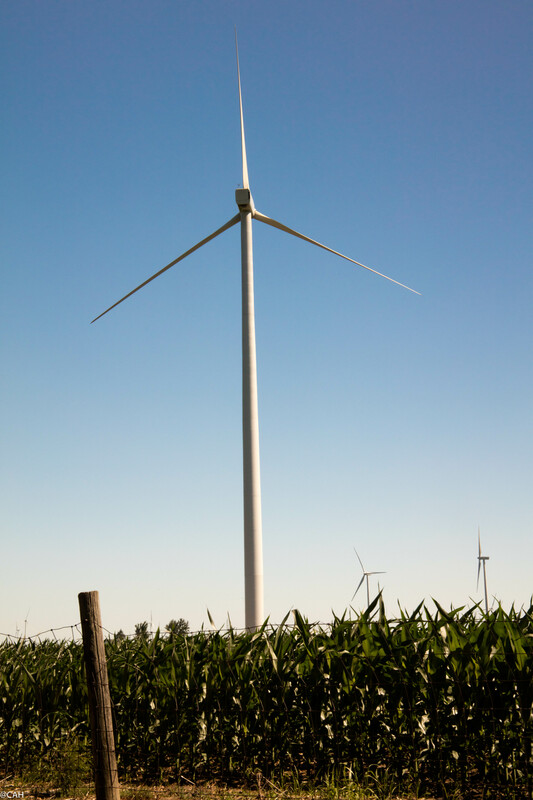 After Van Wert, a wind farm: some people in the USA are moving away from oil. Woodland reappeared after crossing the state line into Indiana and driving through Fort Wayne. Malise Ruthven in his book The Divine Supermarket published in 1991, describes a ‘gruelling drive across the plains of Indiana and Illinois, which took the better part of a night and day. It had been an endless, monotonous landscape of browning fields and telephone lines, relieved occasionally by the occasional giant silo that shimmered in the heat like some distant cathedral. There were no animals in sight, and the only humans were solitary males in checked shirts and baseball caps hunched over the steering wheels of massive trucks. All the interest was in the sky, where the forces of nature were battling it out in thunderstorms that produced sudden, uncanny gusts of wind and hailstorms the size of walnuts’. I cannot say that I agree with him as we have found plenty of things of interest, here in Indiana and on previous drives through Illinois where we are heading on Saturday. Today’s best road sign was one advertising the waiting time at the local ER – only 21 minutes. Near Etna Green, we saw two Amish women crossing the road on a tandem and near Plymouth, an extensive cement mixer graveyard. There are lots of adverts for fireworks as 4th July approaches. 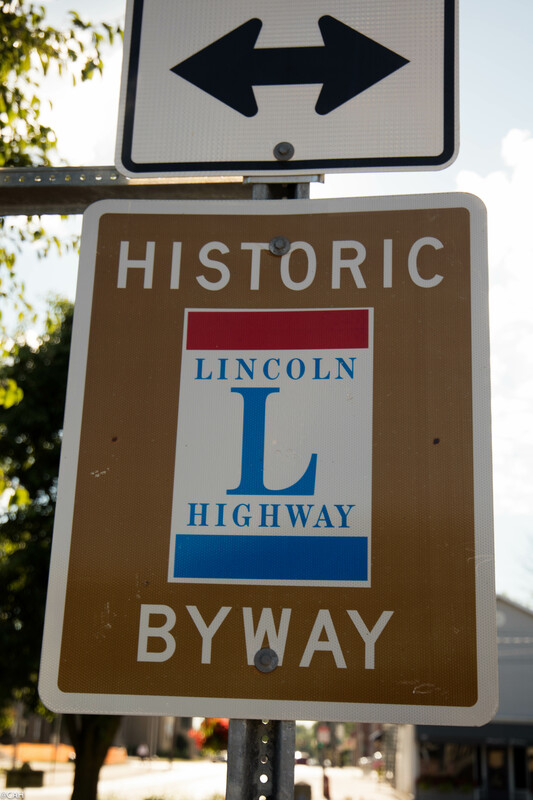 Shortly before diverting from the Lincoln Highway near Valparaiso, we crossed into the Central time zone and gained an hour. The diversion is to spend tomorrow hiking in the Indiana Dunes State Park as a change from driving. We met horrendous roadworks on our way to Chesterton and having picked up trail maps at the Visitors’ Centre, are now settled into our hotel. Hailstones the size of walnuts? Oh my! I hope you enjoyed hiking at Indiana Dunes State Park….and that there were no hailstones in sight!